Click on a doll to see an enlarged picture. #180 - Monday (#1) - SOLD - Bisque, frozen legs, wrist tag, labeled box. Crispy, clean doll with bright coloring. Minor paper loss to box top. #180 - Monday (#2) - $75 - Bisque, jointed legs, pudgy tummy, heavy wrist tag. Dress is somewhat rumpled, but sweet doll. #181 - Tuesday (#1) - SOLD - Bisque, jointed legs, slim tummy, separate pink slip, labeled box with brochure and cardboard restraint. Very pretty doll! #181 - Tuesday (#2) - $325 - Bisque, jointed legs, pudgy tummy, MOLDED SOCKS, lace-trimmed pantaloons. Dress is faded a bit, with blue netting a bit limp and rough along the edges. However, a hard to find doll in nice condition. Love the silk ribbon flowers in her hair and on her dress! #182 - Wednesday (#1) - $195 - Bisque, jointed legs, pudgy tummy, MOLDED SOCKS. Doll is in excellent condition with layers of black and pink netting over a black taffeta slip and lace-trimmed pantaloons. She is unfortunately missing her pink hankie and pink hair ribbon, though she has a very long piece of ribbon tied around her waist. Beautiful face paint and very nice wig. #182 - Wednesday (#2) - $75 - Bisque, jointed legs, pudgy tummy, heavy wrist tag. Sweet polka-dotted dress, and she carries her hankie for her "woes." #182 - Wednesday (#3) - SOLD - Bisque, frozen legs, wrist tag, labeled box with cardboard restrain, brochure. She has it all and is in excellent condition. #183 - Thursday (#1) - SOLD - Bisque, jointed legs, pudgy tummy, labeled box with cardboard restraint. (Label is scuffed.) Lovely condition and a more unique fabric for her dress. Love the cherries on her hat. #184 - Friday (#1) - SOLD - Bisque, jointed legs, slim tummy, heavy wrist tag, labeled box with brochure. Carries her "gift" for giving. Very nice condition. #185 - Saturday (#1) - SOLD - Bisque, frozen legs. Bright, crispy outfit, although there is some very faint discoloration to the dress and the broom ribbon is faded. Pretty doll. #185 - Saturday (#2) - $50 - Bisque, jointed legs, slim tummy. Crispy, clean doll, but unfortunately missing her broom. #185 - Saturday (#3) - SOLD - Bisque, jointed legs, pudgy tummy, heavy wrist tag, labeled box with cardboard restraint. Carries her broom to "work for a living." Excellent condition. #186 - Sunday (#1) - $85 - Bisque, jointed legs, pudgy tummy. Crispy, clean ivory dress. #186 - Sunday (#2) - SOLD - Bisque, jointed legs, pudgy tummy, labeled box, heavy wrist tag. Dress is beautiful and very clean, but seems limp. Nice fuzzy flowers in hair and on dress. #187 - January (#1) - $135 - Bisque, jointed legs, socket head, labeled box. 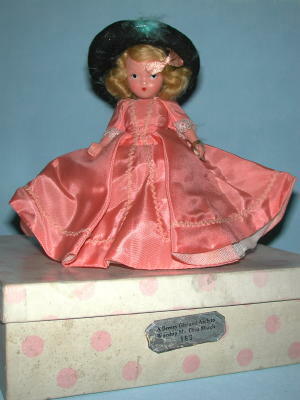 Crisp, clean, brightly colored doll with loads of Nancy Ann ribbon on her hat. #187 - January (#2) - $95 - Bisque, jointed legs, socket head, separate slip. Oodles of Nancy Ann ribbon on her hat. Excellent condition. #188 - February (#1) - SOLD - Bisque, frozen legs, wrist tag. Labeled box looks good from certain angles, but the bottom edge on one side has disintegrated. Doll, however, is crispy clean and cute. #188 - February (#2) - $35 - Bisque, jointed legs, socket head, heavy wrist tag. Doll is beautiful, but dress has significant age spotting and should be replaced. Separate slip and pantaloons are very nice. #188 - February (#3) - SOLD - Bisque, jointed legs, socket head, heavy wrist tag. Ivory dress is lovely though slightly rumpled. Ruffled hem shows some fraying. Lovely doll. #189 - March (#1) - $125 - Bisque, jointed legs, socket head, separate slip, heavy wrist tag. Two teeny holes on the back of one sleeve. #189 - March (#2) - $130 - Bisque, jointed legs, socket head, separate slip, heavy wrist tag, cardboard restraint. Very nice condition. #190 - April (#1) - $95 - Bisque, jointed legs, socket head, separate slip. She carries her wonderful pipecleaner umbrella and wears the matching cape. Nice clean doll. #191 - May (#1) - $65 - Bisque, frozen legs, socket head, labeled box. Beautiful flowers attached to dress. #191 - May (#2) - $75 - Bisque, frozen legs, socket head, separate slip, labeled box, wrist tag, cardboard restraint. 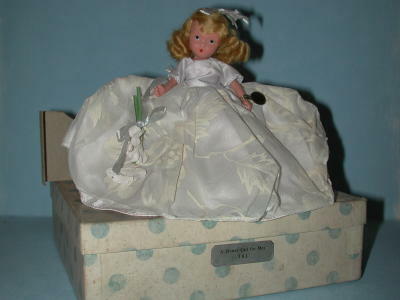 Box is dirty, but doll is crispy clean with beautiful flowers on her dress. #191 - May (#3) - $95 - Bisque, jointed legs, socket head, separate slip, heavy wrist tag. Beautiful doll! #192 - June (#1) - $125 - Bisque, jointed legs, socket head, labeled box (some fading and water stains), cardboard restraint. Note that the flower on her head is loose and the new owner may want to glue it down. Lovely doll! #193 - July (#1) - SOLD - Bisque, jointed legs, socket head. Beautiful doll with brightly colored clothes. I see two teeny age spots on the white, not distracting. Oodles of red, white, and blue Nancy Ann ribbon. #193 - July (#2) - $55 - Bisque, jointed legs, socket head, heavy wrist tag, separate slip. 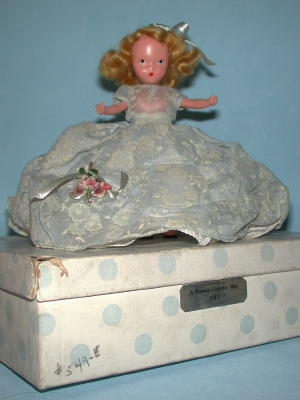 Lovely doll, though some fading to her bodice and she is missing the ribbons at her waist. #194 - August (#1) - SOLD - Bisque, jointed legs, socket head, separate slip. Exceptionally clean, crisp, beautiful doll. You will love her! #195 - September (#1) - $125 - Bisque, jointed legs, socket head, separate slip, heavy wrist tag. Beautiful doll with vibrant coloring! #197 - November (#1) - SOLD - Bisque, frozen legs, socket head. A couple areas on dress with very faint discoloration. #197 - November (#2) - SOLD - Bisque, jointed legs, socket head, separate slip, heavy wrist tag. Love the greenery in her hair and on her dress. #198 - December (#1) - SOLD - Bisque, frozen legs, unlabeled box. #198 - December (#2) - SOLD - Bisque, frozen legs. Labeled box looks good from certain angles, but the bottom edge on one side has disintegrated. Doll, however, is crispy clean, although her green bodice shows some fade toward gold. Green dress ribbons are still bright and attach cherries to the dress on both sides.